It’s a rainy day as I write this. 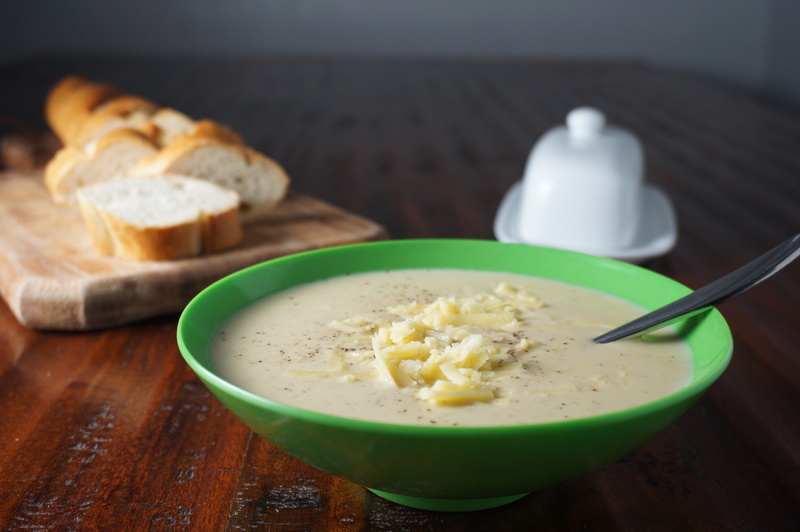 A perfect day to make a soup that I have been meaning to try for quite some time: a cheddar cauliflower soup. For my husband’s sake, I’ve been referring to it as a “cheddar” soup, rather than a “cheddar cauliflower” soup, but he hung out with me while I prepped the cauliflower last night, so I think he’s figured out that I might just be sneaking some veggies into tonight’s dinner. But yes, it’s a cheddar cauliflower soup, and cheddar makes everything better. Especially when it is aged raw milk cheddar from Conebella Farm’s herd of Ayrshires. I love to visit this herd when I have the chance, and I am always impressed with how hard Don and Pam work. This week, Pam mentioned that the recent cold snap meant that Don was going out to the barn every three hours during the night. I am glad the weather has warmed up a bit, for their sakes! Hopefully there will be lots of cozy weather for enjoying soup, but without the temperatures dropping quite so low. Be sure to put this soup into the rotation. 1 cup shredded Conebella Farm Sharp Cheddar, plus extra for each bowl. Note: The veggies can be chopped/minced roughly since everything is going to go in the blender. Saute the shallots in oil over medium-high heat until they are tender (3-5 minutes). Add cauliflower, garlic, Worcestershire, thyme and broth. Bring to a boil, then reduce heat to a simmer. Continue simmering, covered for 30-35 minutes until cauliflower is tender (it should fall apart easily). Let cool, then puree in batches in the blender.